This is one of my favorite of all fruits! 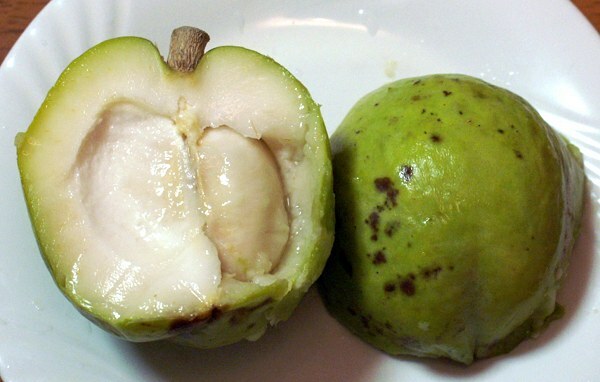 The White Sapote (Casimiroa edulis) is a fantastic, rare fruit that most people are unfamiliar with. 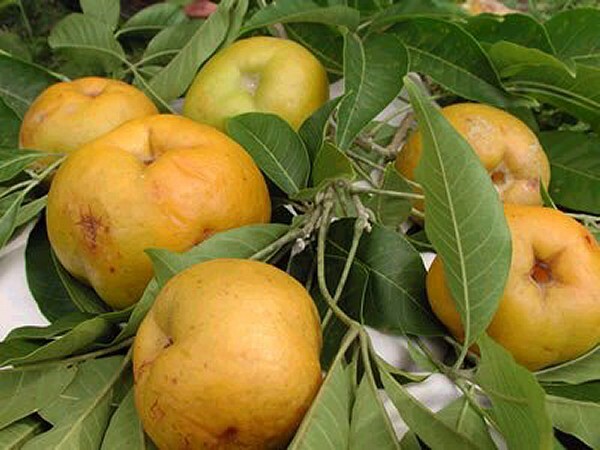 The apple-sized fruits have a creamy texture like pudding, and are very sweet & delicious, with no acidity. I guess you could say it tastes like a custard dessert, with a hint of banana or peach. If you like your fruit sweet, this is a heavenly delicacy! I've never understood why it isn't commonly sold in the U.S. But now you can grow your own supply of fruit at home! 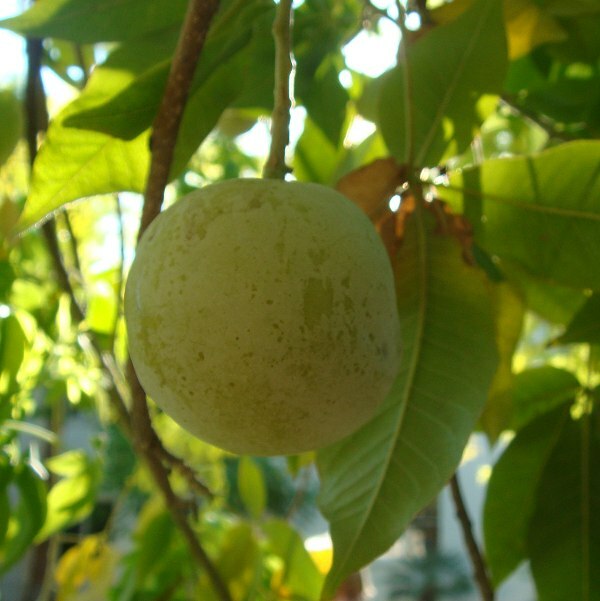 The White Sapote (pronounced sah-PO-tay) is a distant relative of citrus, although the fruits have no similarity to citrus. The tree originates from Central America and Mexico, where it grows 15 to 40 feet tall. 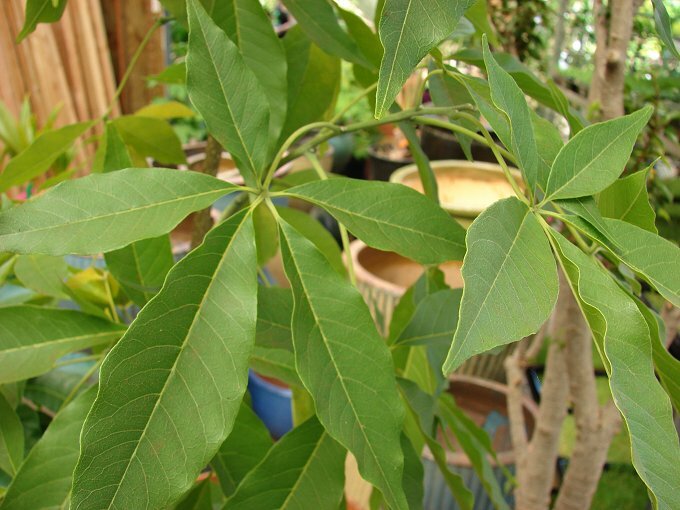 It can be pruned to any height that's convenient, and is easily grown in a pot. The foliage is very attractive, with a nice tropical look. The trees are very productive, and can begin bearing fruit after 8 years when grown from seed. The fruits usually ripen around autumn, when most other fruit trees are bare. Some plants produce fruit year-round. The fruit can be yellow or green when ripe, with a very thin skin that is edible. The White Sapote is happiest in slightly cooler conditions than most citrus prefer. It has been grown successfully in warmer areas like Florida and Arizona, but consider it experimental in areas that regularly get above the low 90s (34°C), particularly if nights are warm. Mature trees can take occasional drops to 22° F (-6°C), but young trees should be protected from frost the first 3 years. Cultivation is similar to most citrus. It prefers well-draining, slightly acid soil and regular watering. It likes part sun to full sun. Some afternoon shade might be needed in hotter areas. If grown in a pot, use a tall pot, to accommodate its deep roots.